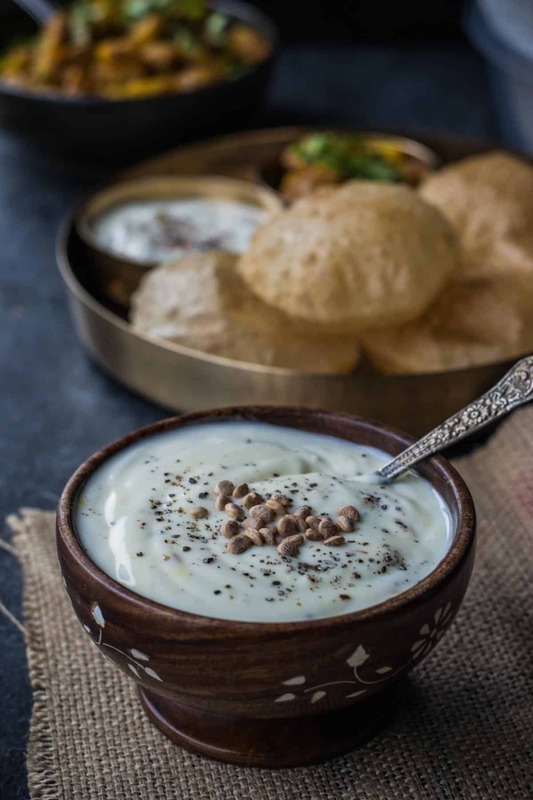 Shrikhand – this addictive sweet dish made from yogurt takes all of 5 minutes and can be served as a dessert or as a delicious accompaniment to pooris. Shrikhand, a popular dish from Gujarati and Maharashtrian cuisine is derived from the word shirkhand – shir (milk) and khand (sugar). It is also referred to as shikrini in Sanskrit which means yogurt mixed with sugar and other ingredients such as saffron, nuts etc. How is shrikhand traditionally made? Straining the yogurt through muslin or cheesecloth to remove the liquid (or whey) from the yogurt. This is done by gathering the ends of the cheesecloth and using one end to tie a knot. Think of it like creating a bundle (or potli as they call in Hindi). Tie the bundle to a ladle or a big spoon and place the spoon over a deep bowl to collect the water. Refrigerate the bowl along with a spoon/bundle overnight. Alternatively, you can use a mesh strainer instead of cheesecloth. Apply pressure to remove the excess water and transfer the thick yogurt into a bowl and mix it with sugar, cardamom, and saffron (if using). Serve chilled. But if you are craving for shrikhand and just don’t have the patience to wait :), you could always get storebought shrikhand. The only thing is the texture is more like refrigerated peanut butter – thick and hard. Nothing like the soft and creamy texture it is supposed to be. The other workaround is to use Greek yogurt to make shrikhand instantly. 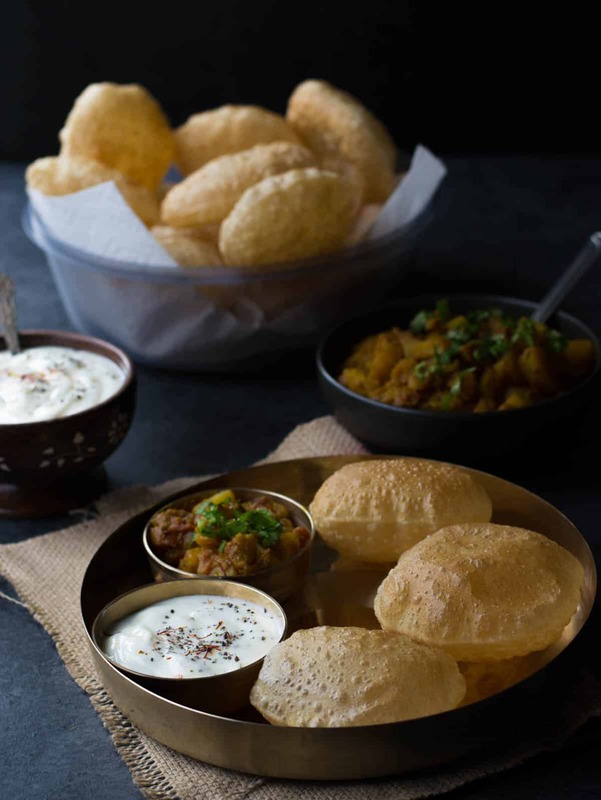 If you are wondering how to make these beautiful, puffed up pooris, get the recipe here. Poori with shrikhand and aloo bhaji. 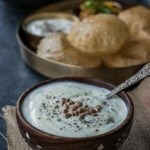 How do you make Instant shrikhand from Greek yogurt? Shrikhand - this addictive sweet dish made from yogurt takes all of 5 minutes and can be served as a dessert or as a delicious accompaniment to pooris. Combine yogurt and sugar in a medium-sized bowl and whisk until the sugar dissolves. Add the remaining ingredients (saffron,chironji, pistachios) and mix well. Refrigerate it to set. Serve cold. Serve with pooris or as a dessert by itself. If using Greek yogurt - When you are spooning out yogurt from its container try to scoop only the yogurt and not the liquid. Also, I used Chobani low-fat yogurt. Any other brand such as Fage should be fine. If using regular whole milk yogurt - strain the yogurt using a mesh strainer over a bowl. Refrigerate it overnight or for 4-5 hours. Transfer the thick yogurt to a bowl and follow step 1.